NECA Celebrates 30 Years of E.T. with New Action Figures and Much More! Yes, We Can Make Your Finger Glow in the Dark. Thanks for Asking. You are here: NECAOnline.com » Licenses » Movies » E.T. » NECA Celebrates 30 Years of E.T. with New Action Figures and Much More! 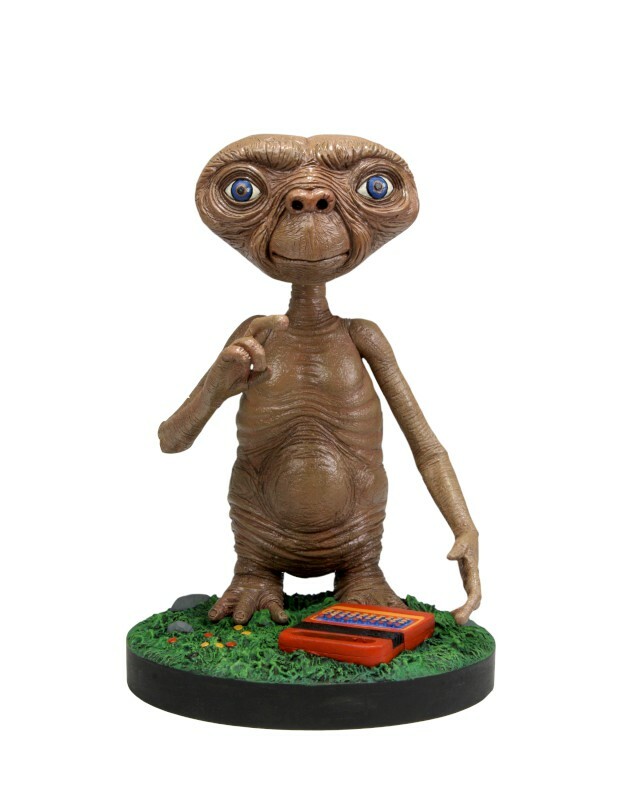 Phone home and tell ’em NECA sent you. Whether you believe those government agents were holding guns or walkie-talkies, there’s no denying that Steven Spielberg’s über-classic E.T. is one of the most imaginative fantasies ever constructed for the screen. Released in 1982, it was a movie that ignited and inspired a generation of kids while thrilling their parents and, among other things, immortalizing the Speak & Spell forever as an alien communication device. 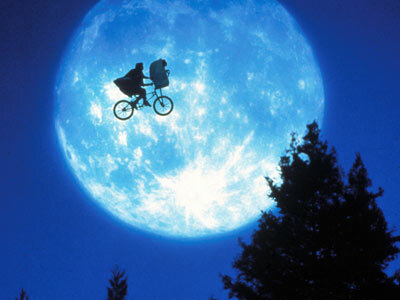 We here at NECA — stalwart pop-cultural preservationists as we are — are celebrating the 30th anniversary of E.T. the best way we know how: with a whole load of brand-spanking-new merchandise from the movie. And you know when we do it up, we do it up right. 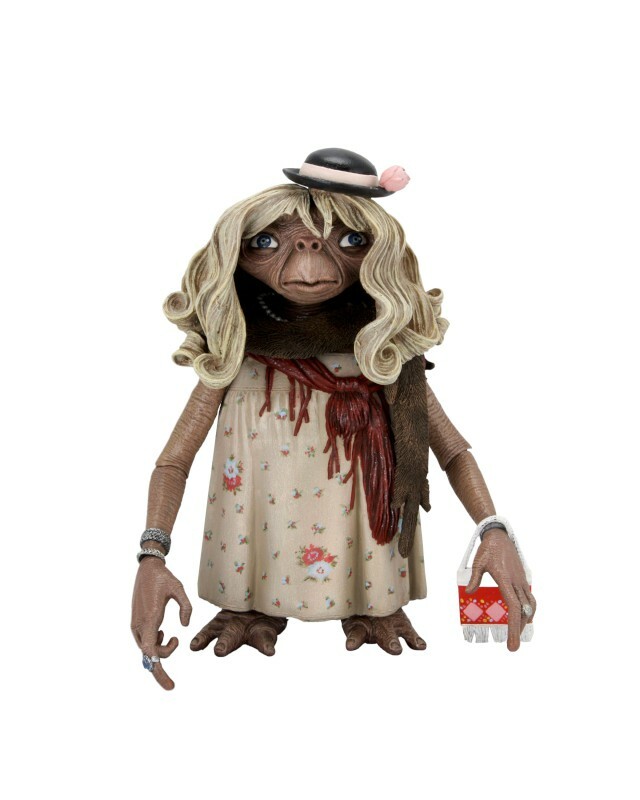 I mean, action figures and Head Knockers are one thing (we’ve got ’em), but we’ve gone all out this time and we’ve got an actually E.T. hand with an LED light in the finger for that special bit of cine-magic. As you can see in the image gallery above, the E.T. replica hand lights up in the finger when pressed. It’s got an adjustable wrist-strap and is battery operated, but seriously, it could run on coal for all we care. It’s a light-up E.T. hand! What could possibly be cooler than that? 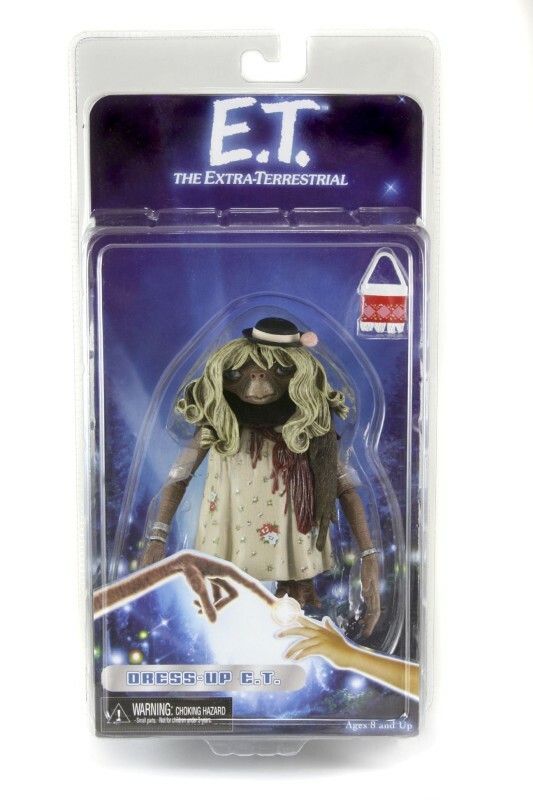 You could need E.T action figures and an E.T Head Knocker, that’s what. And of course we’ve got you set up there too. Both of the figures in our E.T. Series 1 assortment feature incredible detail straight from the movie. E.T. 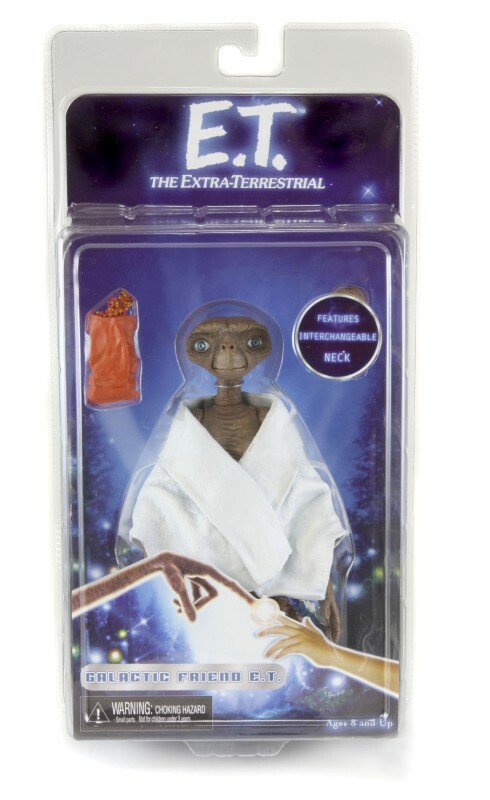 The Galactic Visitor comes with interchangeable necks, a white robe and candy, and Dress-Up E.T. has a dress (duh), a wig and a hat. Both figures have ball jointed necks, shoulders, elbows, wrists, and ankles. The E.T. Head Knocker is even larger, standing nearly a full 7″, and also exquisitely sculpted. It stands on a base that includes a Speak & Spell and is reaching its finger out to touch yours. Comes in a closed box and makes an otherworldly addition to your desk, shelf, dashboard or — why not? — bicycle. All of our E.T. merchandise is available starting this month and we’ll be continuing to celebrate the 30th anniversary throughout the year with the new DVD and Blu-Ray releases. And just wait until you see what we’ve got in store for the Series 2 action figures! 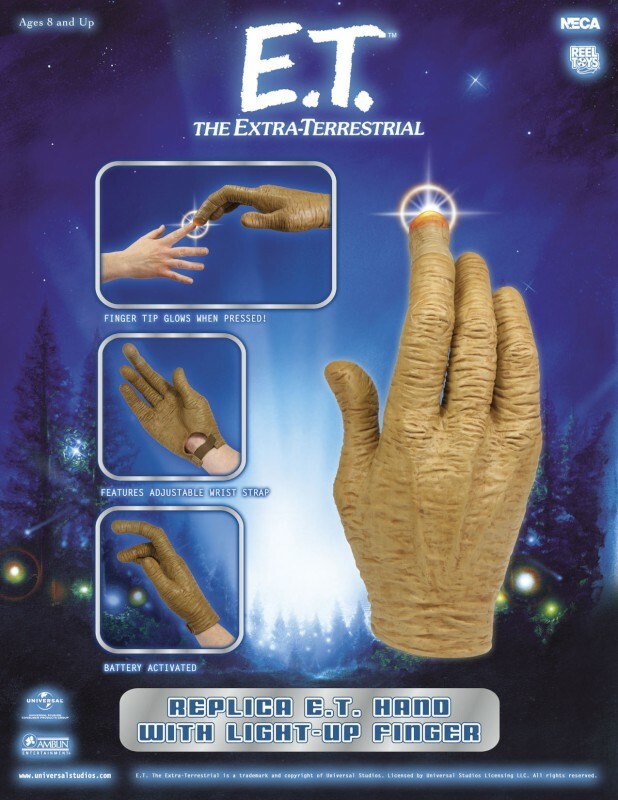 You can find the E.T Hand Glove, the Galactic Friend, the Dress-up E.T. 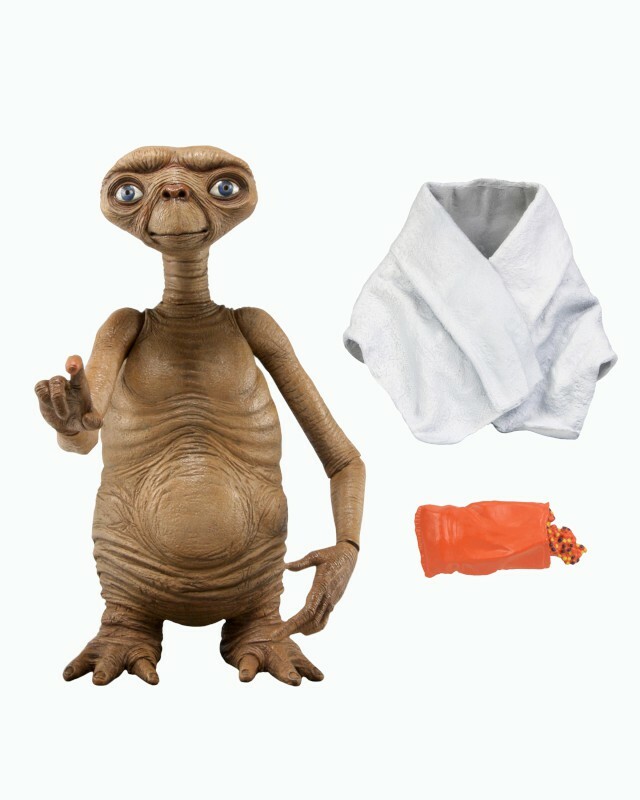 figure and our upcoming E.T. Headknocker on Amazon. Check it out! Keep it tuned to your favorite wholesale action figures provider for updates on E.T. and all your favorite movies, games and more!